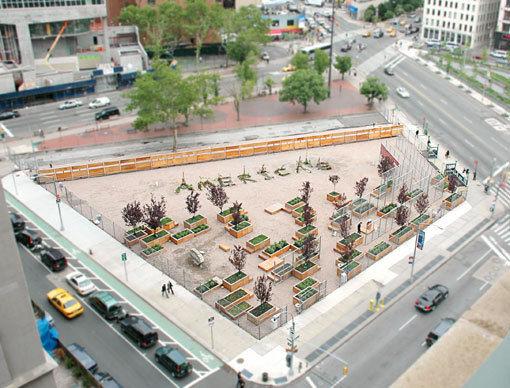 Lower Manhattan Cultural Council's Avenue of the Americas at LentSpace, a free contemporary art space made possible by the temporary use of a Trinity Real Estate development site in Hudson Square, is now on view and open to the public! Avenue of the Americas is a site-specific sculpture exhibition, which literally sits at the gateway of Sixth Avenue, and features artists from North and South America tackling themes related to the social and political issues confronting American societies. The exhibition features a series of new artist commissions by Julieta Aranda, Carlos Motta with David Sanin Paz (horticulture), Judi Werthein, and Carla Zaccagnini. For a full schedule and more information, including artist talks, tours, and events, please visit http://www.lmcc.net/cultural_programs/lentspace/avenue_of_the_americas. The aim of this exhibition is to create a public showcase, which fosters an increased understanding of and appreciation for the diverse cultural heritage of the Americas through a public art exhibition that speaks to the importance of inter-American relationships. Sixth Avenue was renamed Avenue of the Americas in 1945 by Mayor Fiorello H. LaGuardia (1882-1947) as a place to honor "Pan-American ideals and principles" by the creation of public monuments and plazas. Exploring an interest in communication, the four art works in Avenue of the Americas create work that utilize language, text, and iconic emblems, which create reference points for these narratives, and will stimulate visitors to explore many points of interest and engage in a continued discussion. Additionally, 2010 marks several important anniversaries in the struggle for Argentine, Chilean, Colombian, and Mexican independence. 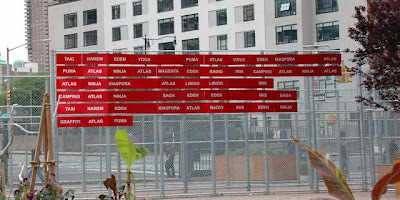 "Taking a cue from the New York Times reporter who once wrote that the Avenue of the Americas "figuratively stretches the length of the Western Hemisphere", we can find parallels to this social and art historical tale of Pan-American dreams and discord on the Avenue with the history of Inter-America relationships throughout the 20th and 21st centuries. At the end of his article, David Gonzalez called attention to the 1945 New York Times editorial as well. In particular, Gonzalez noted that in 1945 "the Avenue of the Americas symbolizes a bond of social union which should long outlast such strains as those imposed by the current upheavals in Argentina and Venezuela," yet 63 years later Venezuela was still in "upheaval." Likewise, other mirrors to the street and Pan-American history can be found as NAFTA established a larger "trade" within part of the hemisphere. For example, the rusted medallion representing Cuba, which hangs near West 4th street, sits adjacent to a police security camera. Conversely, Canada hangs distinctively lower than the rest of the medallions and is thus much more accessible. It is within this complex stew of hopes, realities and still yet to be actualized possibilities, that the Avenue of Americas exhibition, one of the first major public art exhibitions on the avenue in recent memory, has asked various artists from North and South America to question what is Pan-Americanism today. As Argentina, Columbia, Chile, and Mexico gear up to celebrate their 200th anniversaries this summer, while a contested immigration bill is under consideration in the great state of Arizona, not to mention the recent relief efforts for the victims 2010 Haitian Earthquake, this question of Pan-American dialogue and understanding is just as pertinent today as in 1945. Hopefully, this exhibition and its public showcase may foster an increased understanding of and appreciation for the diverse cultural heritages that are the Americas. Exploring similar interests in communication and representation, the four artworks in this exhibition all utilize language, text, and iconic emblems to create reference points for these narratives, and stimulate visitors to explore many points of interest in a still unfolding discussion." Borrowing images from Latin American television history, Julieta Aranda presents Tiger, Tiger…. (The Institutionalized Revolution), a large concrete-sculpture portraying a derelict, ruined rendition of the original logotype for media conglomerate Grupo Televisa, the largest media empire in the Spanish-speaking world. Like today's rhetoric around the media empire of Rupert Murdoch and Fox's promotion of a "Republican mindset," Televisa was known for its unbinding support of the right-of-center political party PRI (Party of the Institutionalized Revolution), which ruled Mexico unilaterally and uncontested for over 70 years. Yet, in addition to controlling Mexican political reporting through Televisa's equally uncontested monopoly, Azcarraga also helped to shape Mexico's own public image through his signature entertainment programming, featuring widely popular telenovelas and variety shows. Taken all together, this installation's balancing act which blends together symbols of Azcarraga's influence, intends to highlight the paradoxes present in the construction of a shared Latin American identity, while also examining the fabric of Mexican politics during the second half of the 20th century. 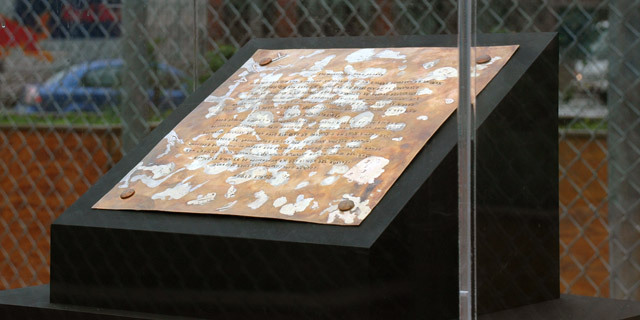 Taking the form of many memorials found in public spaces, Judi Werthein presents La Caca de los Dioses, an honorific plaque inscribed with Argentine writer Julio Cortázar's (1914 –1984) "Instructions On How To Cry." In addition to bronze, the plaque itself is comprised of melted gold, silver, and even a solo diamond. Werthein collected the raw materials for this project by purchasing jewelry, often inscribed, from pawnshops throughout New York City frequented by lower income communities. The traces of these lost treasures, crosses, rings, pendants, charms, and the like can still be seen as some are partially embedded into the final plaque. For the inscription of the Cortázar text, Werthein worked with a speech pathologist to "translate" the original Spanish text in such a way that it can be sounded out and recited by a native English speaker in the distinctive Argentine accent. The original, the English, and the phonetic translations can be found in the Avenue of the Americas newspaper catalog distributed on site for free. "Alpha, Bravo, Charlie, Delta," or A, B, C, and D, is the beginning of the NATO Phonetic Alphabet, an international code language used by air traffic controllers, ships, and others to prevent transmission errors. Even though this system is utilized as a "universal tongue" it is replete with references to Anglophone culture, such as "Foxtrot," "Yankee," and "Whiskey." In order to create a more inclusive alphabet, Carla Zaccagnini has created Alfabeto Fonético Aplicado II, a new code that blends a greater set of cultural references, for example: "Ninja" for N and "Yoga" for Y. 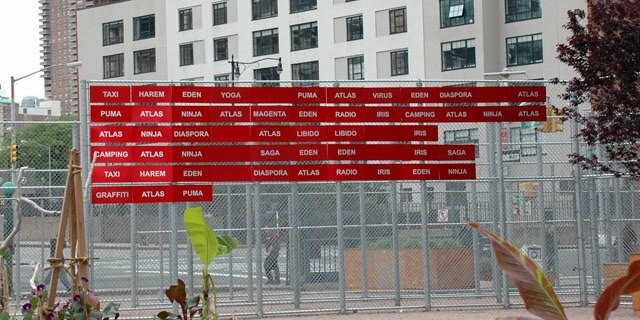 For Avenue of the Americas, Zaccagnini uses this new alphabet to create a short encoded sentence on the Darién Gap, a 91-mile long "missing link" in the 29,800-mile Pan-American Highway. Late Editions: What is Pan-Americanism? Punning Late Editions--when newspapers used to release an evening edition with breaking news with a "late addition"—this print-media-based series puts the current exhibition and the exhibition space up for review by artists. These prints will be nested into LentSpace's own program guide as inserts and distributed on-site in newspaper distribution boxes for free, while supplies last. Appropriating the newspaper distribution boxes in LentSpace as a gallery in-itself, each edition will become both part of the larger exhibition and the exhibition site, yet will also serve as a take-home gift—often found by surprise—for any visitor. 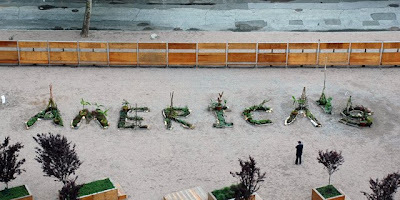 As a point of departure from the previous Late Editions series, What is Pan-Americanism? 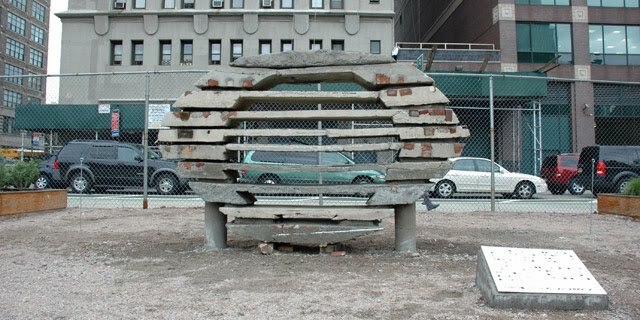 will create a small volume of thematically joined works centered around a provocative change.